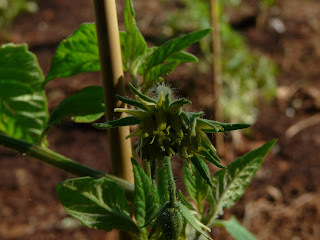 fluffnflowers: Mmm, more tomato flowers! I can't wait until we have fresh tomatoes! All of my tomato plants have flowers all over them, and it'll be soooo nice to have a tomato with taste again. I don't think I've ever had a single flower on my Brandywines, but this one has the most multiple flower I've ever seen, I think. It looks like a little monster, but it's pretty cool. The tomato is probably going to be a big, ugly, fused thing! Wow, flowers already! I don't even have my plants in the ground yet...yikes! mm, I love tomatoes so much, especially home grown! I hope they are very very yummy.